The coolest fundraising event EVER to benefit the kids! Due to the unexpected weather, join us on Friday, November 16, 2018, 7:00pm to 10:00 pm (Doors open 1 hour earlier for VIPs) at the Manayunk Brewery & Restaurant, 4120 Main Street, Philadelphia, PA 19127. 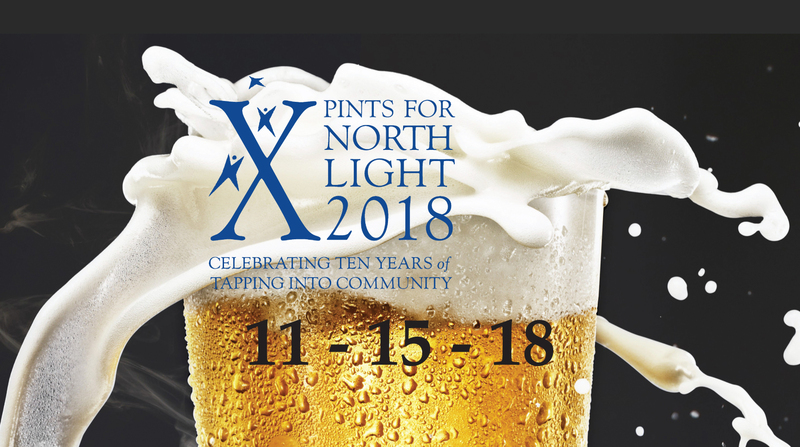 Celebrating it’s 10th Anniversary, Pints for North Light has continued to grow and raise much-needed funds to keep North Light’s programs and services affordable. Last year’s event sold out! You can be part of the continued success by becoming a sponsor or donating to the auction. Online ticket sales have closed. Tickets will be available at the door tonight. A “Taster” is $50 in advance, $60 at the door will get admission for one person, and one Pints for North Light glass. A “VIP Brewer” is $75 in advance, $80 at the door per person (if available- a maximum 100 tickets) or $135 for 2 people, and will get early admission with access to exclusive beers, free parking, and the glass(es). Thank you to the corporate sponsors, and everyone who donated beer and food!